Vegetarian & Vegan For Everyone! All recipes: Vegetarian and Vegan. Though I do soy hotdogs occasionally, this is my first time to try a vegan sausage. It sounds like an oxymoron, doesn’t it? I mean, traditional sausage is about as far opposite to vegan, vegetarian, or healthy as you can get. The Field Roast people do perhaps too good of a job of imitating the whole sausage experience. These are good. I tried the Mexican Chipotle version. Spicy!! They also make sausage with Italian seasoning, and one which is apple and sage. I pan fried these but the packaging says they can be pan-fried or grilled. They seem substantial enough to hold up to grilling, and I’ll try that next. There are a couple of not-great things you should be aware of. The individual sausages are encased in a very tough plastic wrapper, which naturally needs to be removed before cooking. They recommend slitting the casing lengthwise to remove them. I agree, but cutting the plastic was delicate process, trying not to damage the sausage, and the plastic was tough to cut. On the other hand, despite the thickness and toughness of the plastic, the sausages started leaking in the fridge after we bought them, so we had to clean up the orange grease and put them in a baggy until we cooked them. So even with tough plastic, be aware that the twisty tied ends may leak alarming orange grease. And that alarming orange grease is the other thing that I had a problem with. I get that sausages are supposed to be greasy, and the grease was orange because of all the spices, but by the time I managed to get the plastic on the sausages off, my hands were covered with thick orange grease, the sink was splattered with orange grease, the counter had orange grease drippings and splatter on it. Do not make these sausages wearing anything that you can’t afford to get grease on! Because it was basically everywhere. For these Mexican Chipotle seasoned sausages, I recommend refried beans as a side dish. The flavor was complementary and it seem to cut the heat a bit when the spiciness built up after a few bites. While most of the world is experiencing the summer fun of July, here in my part of the world we are experiencing Julember – the calendar may indicate it is July, but the weather is indicating it is November. With temps hovering around 9C, I have spent the past week thinking of soup instead of salad, socks instead of sandals, and Santa instead of summer. The normally ignored fireplace has been lit every day this week and I have been knitting – not one of my regular summer activities. 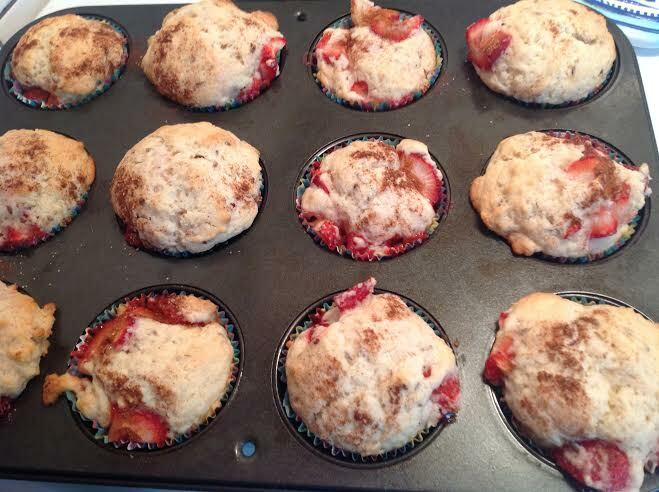 So, when a recipe for strawberry muffins popped up in my Facebook feed I jumped at the chance to mix a traditional comfort food with a summery delight. I gathered the ingredients and immediately called my visiting sister and her family to drop over for a sit by the fire, coffee, and muffins. With help from my adorable nine-year-old niece, and changes to the recipe to veganise it, the dual season muffin-making began. As always, prepare your flax egg first: 1 tbsp of flaxseed and 3 tbsp of water. Mix in a small ramekin and let gel. This is also a good time to hull, clean, and chop the strawberries. 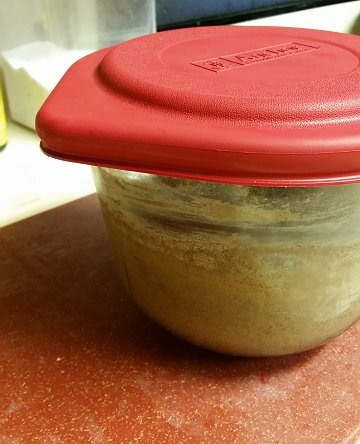 I usually make a small bottle of sugar and cinnamon to have on hand so I don’t have to prepare this much-used topping every time a recipe calls for it. With your nine-year-old niece having a tight grip on the mixer, cream the butter and sugar. Add the flax egg and mix well. Sift flour, baking powder, and salt in a small bowl and let the wee child stir it about. Add the flour mixture and the milk alternately to the butter mixture (much more fun when two people are doing this!). Add vanilla. Stir in strawberries. 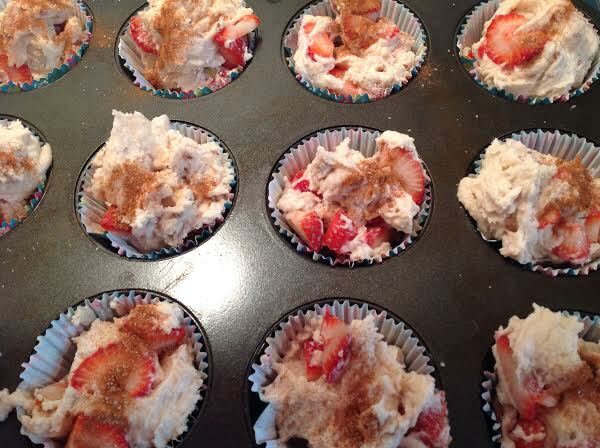 Spoon batter into muffin pans and sprinkle the topping on the batter. Of course, only small children are allowed to sprinkle the topping on the muffins. This recipe makes one dozen regular-sized muffins. Now announce to all and sundry that the beaters, bowls, spoons, and spatulas are ready to be licked! Go sit by the Julember fire and enjoy!! As the summer gets hotter, we’re all looking for things that are cool and refreshing. There’s something about lemon that is bright and reviving on even the hottest days. Commercial lemonade tends to be too sweet for my taste. I like to taste the flavor of the lemon, and super sugary drinks don’t feel like they really quench thirst, especially since they leave my mouth sticky. So my formula for lemonade is a bright slightly tart one. If you want it sweeter, you can add make it sweeter, of course. A good idea is to make the basic batch that I make, then let everyone sweeten their glasses to their own taste if they they prefer something sweeter. I also use this same formula to make ice pops. After mixing it up, pour a bit into your favorite popsicle mold. Unless you’ve got a lot of popsicle molds, you’ll still have plenty left to drink because it makes 9 cups total. I use warm water to mix this up so that the sugar dissolves quickly and easily. If using something like honey or agave nectar, the temperature of the water wouldn’t be a factor. However, if you use something other than sugar, be sure to adjust the amount according to how sweet your sweetener is. A half cup of honey, for instance, will be sweeter than a half cup of sugar. So the amount of sweetener you use is dependent on what you use to sweeten the lemonade — as well as your own personal taste for how sweet you want it to be. My formula is a good starting place. It’s delicious as is, but is easily adjusted to suit individual tastes. Stir the sugar into the warm water until dissolved. Add the lemon juice. Stir. The mixture will be cloudy. Chill thoroughly. If making lemon ice popsicles, fill popsicle molds not quite to the top (liquid expands as it freezes). They’re ready to eat when they’re frozen solid. Honestly, I don’t know how long it will take to freeze. It depends on the size and shape (volume) of your popsicle molds. I typically don’t reach for a popsicle until the day after I put a batch into the freezer, but they should freeze faster than that! The sweet-tart flavor is perfect for a refreshing summer ice. Check out my Rocket Pops post for a different popsicle idea! With a holiday in the U.S. this weekend, it’s prime time for a summertime party. 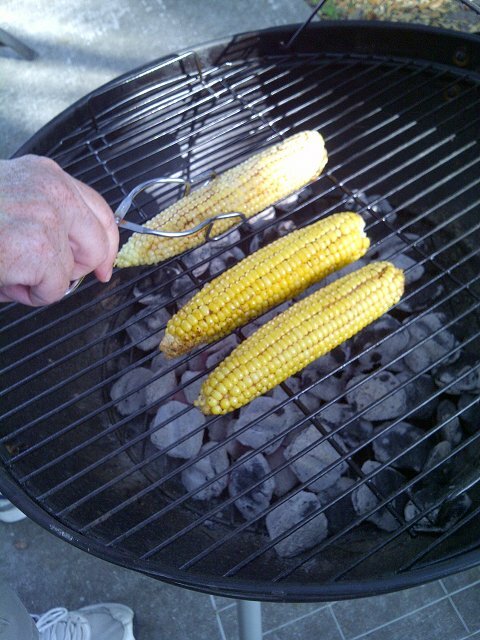 We have lots of cookout ideas on the blog, some of which I covered at the beginning of summer with my Cookouts post. Here’s one more salsa recipe to add to last week’s Deadly Green Sauce. Unlike last week’s salsa recipe, this is a uncooked salsa, and it’s relatively mild. I suspect that the way I make it isn’t traditional. It is, however, flavorful, and makes a lot. The proportions of ingredients are a matter of individual taste. The amounts below are guidelines. Some people don’t like cilantro; you can substitute parsley, but keep in mind that the flavor will be radically different if you do. The amount of jalapeños depends on the size of the pepper as much as how hot you want it. Because this is a large batch of salsa, the amount of jalapeños in the recipe isn’t as excessive as it might appear. Use more if you want it to have more of a kick. Freshly chopped jalapeños can sometimes cause skin irritation so food handling gloves are recommended. This makes about 6 cups. The oil and vinegar give this almost the character of a chopped salad, albeit one in which cilantro and parsley stand in for the leafy greens. I learned to make it like this right after college; I had some that tasted great, so I asked what was in it. That’s how I found out about using an oil and vinegar dressing, which I think helps the flavors to meld. Stir all the ingredients together well. Chill thoroughly before serving. This is good to make up ahead of time; the flavor will improve the longer it chills. Give it a good stirring before serving. As a dip, it’s fairly chunky. This is often used as a flavorful addition to wrapped-in-tortilla things. See the Cookout for Vegetarian, Vegans and Friends who aren’t too sure about this post for cookout suggests for this Independence day. Also check out the snacks, yummy dips, and salsa tags for more recipes. This is the hottest thing I’ve posted here, so if you think some of my other recipes are too spicy, buckle up your safety harness ’cause this is rocket fuel (though the formula can be used with other, milder, peppers, if you prefer). It’s an authentic Mexican recipe and too hot to make often. But it really has a great jalapeño flavor, once your taste buds have adjusted to the assault. I also like the way it handles the jalapeños; you don’t have to use gloves or burn your fingers on chopping jalapeños. This is a good way to use up your heavy-bearing pepper plants in the summer. It’s a very, very, basic recipe. Fast and easy. Put the tomato, jalapeños, and onion into a saucepan and simmer until the peppers are done. Test the peppers with a fork; they’re done when they’re soft. Scoop out the tomato, onions, and peppers with a slotted spoon, reserving the liquid. Put the vegetables into a blender and add the garlic powder and 1/2 cup of the cooking liquid. Blend until homogeneous. If the sauce is too thick, add more juice. Cool. Serve with chips. Warn your friends! Terrific alternatives: As I mentioned above, this is a pretty basic recipe and if the idea of packing that many jalapeños into sauce horrifies you, there are less dangerous alternatives. There is a milder variety of jalapeño called the TAM jalapeño (developed at Texas A&M). If you want something hotter, try using habeñeros (though you might need to use fewer of them). I honestly wouldn’t want to recommend it because I don’t want you to hurt yourself. This jalapeño recipe ought to be more than hot enough for most people. This is a good formula for making a cooked chile pepper sauce. Try other types of peppers with different flavors and levels of hotness. You’ll need to guestimate how many to use since they’ll be a different size than the peppers used in the recipe. Choose a pepper (or assortment of chiles) you like the flavor of because this is mostly cooked pureed pepper, so that will completely dominate the flavor. It’s also a good way create your own custom salsa; experiment with mixing a variety of peppers until you get the blend of hotness and flavor you want. At this point you may be curious what my own custom salsa recipe looks like. I should probably come up with one, but what I usually do is just fake my way through with whatever peppers I have on hand in the garden, which varies throughout the summer and from year to year. There was one year in which I let the jalapeños and a few other chile peppers (7 varieties total) ripen all the way to red…and it was an unusually hot summer where I lived at the time (temps over 100 on a daily basis, which results in hotter peppers). I showed up at a friend’s house bearing a container of sauce that stopped him dead in his tracks. “That’s a scary shade of red,” he said. It was, indeed. We emptied his cupboards of tomato sauce trying to dilute it down enough to use as an enchilada sauce. It was great, but we couldn’t really see the food because our eyes were watering so much! So, if you grow your own ingredients for this, be aware that letting chiles ripen all the way to red will result in a hotter pepper, and places with hotter climates will produce hotter peppers than places with milder summers. Mix and match with whatever you’ve got on hand from the garden or whatever is available from the supermarket. Summer through early fall is prime time for peppers. Experiment and enjoy! Hot, hearty, spicy, fast, easy, and delicious! What more could you want? This is another of my “cupboard is bare” improvisations. There are a few things I’d recommend having on hand to keep from having absolutely no options when you need a fast flavorful hearty meal. Find a spice blend that’s not part of your usual flavor palette. In this case I’m using saté, a flavor combination which is Indonesian in origin. Having some blend that’s not your usual Italian, Mexican, Whatever, is a nice change of pace and can make those hasty “cupboard is bare” meals into something special. For this reason I keep not only saté, but also a Turkish seasoning blend from Penzys on hand. Another thing I recommend keeping on hand is a lot of different flavors of pasta. Pasta cooks quickly and it’s filling. Flavored pastas are often colorful, too. What to put on it? Please, please, stock tomato paste in your pantry in addition to tomato sauce. Tomato paste is basically concentrated tomato sauce. Stocking it means that you can control the thickness of the sauce, so for fast meals when you want a thick sauce it doesn’t take as long to cook down to desired consistency. But stocking it in addition to tomato sauce means that you can still make sauce, even when you’re out of sauce! It’s also handy for thickening up a pasta sauce that’s too thin. 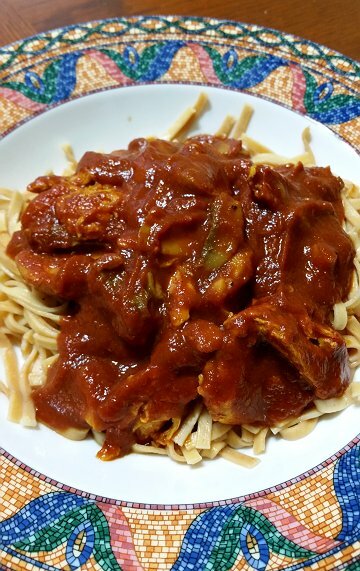 When I use canned diced tomatoes for sauce I add tomato paste to give me a better thickness and texture to the sauce. So stock some small cans of tomato paste! They’re unbelievably handy! For this recipe I used Penzys saté (which does have salt), paired with some complementary seasonings. For pasta I used a half bag of Al Dente Spicy Sesame Linguini. (I had more pasta than sauce.) It is not, to my palate, very spicy…though their red chili fettuccine is. So, you might want to omit the pinch of red pepper if using a spicier pasta than the Sesame. Or omit the red pepper if you’re leery of spicy-hot food. The saté seasoning has spiciness built in to it, so additional red pepper is optional and really a matter of whether you want this spicy or hot. The seasonings I used will still give you a very flavorful somewhat spicy sauce, with no additional red pepper added. Needless to say (but I’ll say it anyway) you can make a better version of this if using fresh mushrooms sautéd in a small amount of oil prior to throwing the sauce together. And adding more water and simmering this longer will allow the flavors to meld even more. But this is the fast version for those nights before the grocery shopping trip, or when for whatever reason (getting home late) you realize that you just don’t have the time or energy to do some more elaborate thing you’d planned. There’s no reason you can’t have a great tasty meal even if you have little time and few ingredients. Don’t settle for a can of something! Keep a special seasoning blend, tomato paste, and an assortment of pastas in your pantry. Don’t ever let those basics run out! This makes enough for two generous servings. Increase sauce ingredients to make more. Al Dente Spicy Sesame Linguini or other quickly cooking pasta. Mix all the sauce ingredients, including the griller strips, in a saucepan. Add at least one can of water to the paste. You may need to add more. (I did.) Cook until the sauce is to the desired consistency and the griller strips are done. The griller strips package has a recommended temperature for cooking. Since the strips are frozen, make sure you simmer them long enough to cook them! Cook the pasta according to package instructions. What will take the most time is getting the water to a boil, especially if you use a large pot, which I recommend to help avoid boil overs. Serve sauce over pasta. Leftover vegetables can be served as a side dish. Or you can steam some in the microwave while waiting for the pasta water to boil. 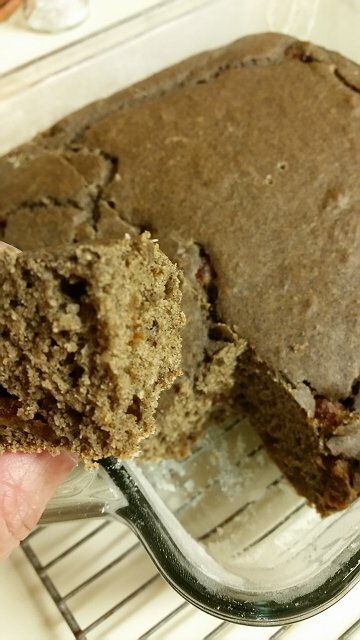 Buckwheat Sourdough Spice Cake. Still warm from the oven! 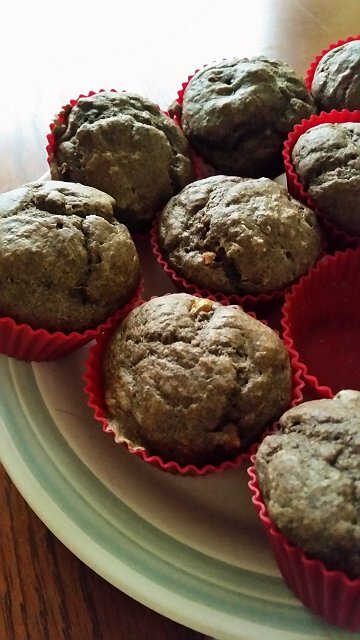 This batter is a variation on the Buckwheat Sourdough Muffins last week. It’s sweeter, has more dates, and also a complex mixture of spices which complement both the buckwheat and the dates nicely. It’s baked in an 8″ x 8″ pan. Preheat oven 350. Grease and flour an 8 x 8″ pan. Put the 1 cup sourdough starter into a bowl. 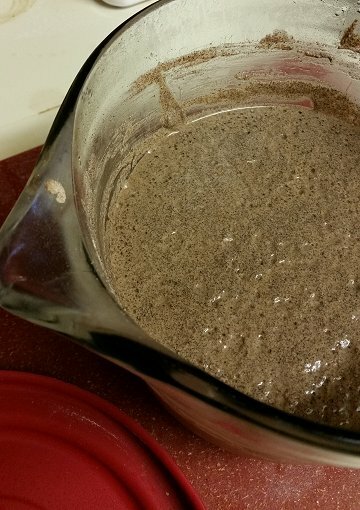 (The rest of the starter you will replenish and put back in the refrigerator See Sourdough Starter post.) Add all the rest of the ingredients to the bowl with the 1 cup of starter. There may be a better way of doing this, like mixing this and that, then adding…but I just dump all the ingredients into the bowl on top of the 1 cup of starter and stir it all together vigorously. No need to get out your mixer. It whips up into a batter very quickly. I stir until the flour is completely incorporated. Let cool slightly in the pan on a wire rack, then cut into squares and serve warm with strong black tea or coffee. If you like the flavor of buckwheat, check out the Buckwheat tag for more posts! Note the empty muffin cup: I couldn’t even resist long enough to take a pic! If you’ve made my sourdough starter and buckwheat cakes, no doubt you’ve wondered what else you could do with the sourdough each weekend. How about some muffins? This is super simple. The dates and cinnamon blend with the buckwheat flavor beautifully and subtly. I eat these hot straight from the oven. These muffins aren’t super sweet. I love the flavor, but if you want a sweeter muffin, you can bump up the sweetness by adding slightly more sugar or more dates or both. Put the 1 cup sourdough starter into a bowl. (The rest of the starter you will replenish and put back in the refrigerator until the next weekend; see Sourdough Starter post.) Add all the rest of the ingredients to the bowl with the 1 cup of starter. There may be a better way of doing this, like mixing this and that, then adding…but I just dump all the ingredients into the bowl on top of the 1 cup of starter and stir it all together vigorously. No need to get out your mixer. It whips up into a batter very quickly. I stir until the flour is completely incorporated. Divide the batter evenly among one dozen muffin cups. I use silicon muffin cup liners. Bake 20-25 mins. (My oven it’s 25, yours may vary. Toothpick inserted should come out clean.) If you love the flavor of buckwheat, you’ll love this as well as my Sweet Weekend Sourdough Buckwheat Cakes. Some of you may recall my Buckwheat Sourdough Pancakes from a couple of years back. I didn’t keep up with the starter after a while (I’m the only one who likes buckwheat cakes around here), but recently made the starter again, this time with the idea of using it for other things. So, I’m reposting a more concise version of the instructions for making the starter — just the starter — today. In the next two weeks I’ll post some other yummy things you can make with it, besides the Buckwheat Sourdough Pancakes. You will need 4 cups of buckwheat flour total for the first week, just to create and feed the starter, more if you make buckwheat cakes with it at the end of the first week. I usually buy two packages Bob’s Red Mill organic buckwheat flour at a time when I’m shopping. I began the starter on a Monday and “fed it” as follows Tues-Friday, so that it’s ready to use by the weekend. Choose whatever timing works best for your household. Day 1: In a glass bowl or other non-reactive container (not metal! ), dissolve 1 pkg of active dry yeast in 2 cups of warm water. Stir in 1 Tbls honey, then 1 cup buckwheat flour. 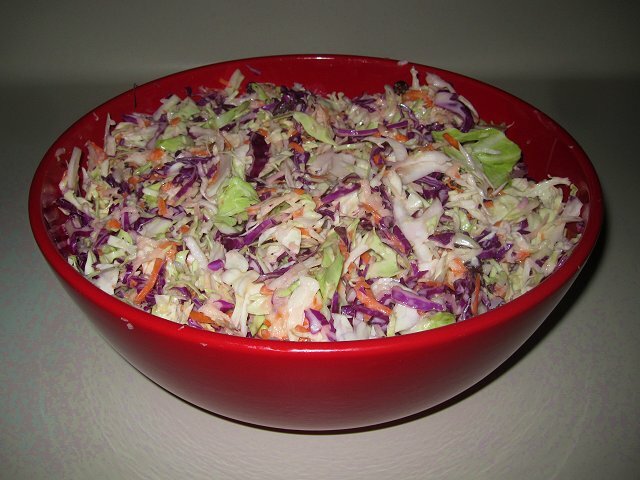 Leave the starter in the glass bowl, lightly covered, either with plastic wrap or a lid not fastened down, in a dim room. Day 2: (The day after you mixed up the starter.) Stir well, then remove and discard 1/2 cup of the starter. Add 1/2 cup buckwheat flour and 1/2 cup water. Stir well. Day 6: Remove 1 cup of the starter and set aside to make buckwheat cakes or to use in baking. Add 1 cup buckwheat flour and 1 cup warm water to the remaining starter mixture. Cover the remaining starter mixture (a lid works better than plastic wrap) and refrigerate. You will not touch the starter again for another week when you will once again remove 1 cup of the mixture for buckwheat cakes or baking and add 1 cup buckwheat flour and 1 cup water. Do this every week. A well-tended starter will develop a wonderful spongy, almost mousse-like texture over time. Don’t worry if feeding and making/baking doesn’t work out to exactly one one week: it won’t hurt anything to wait an extra day to feed the starter and use what you remove. Because I have more time for cooking and baking on the weekend, I set my starter up to be ready to go on a Saturday…and if Saturday is too busy, I use it and feed it on Sunday. You can let it slip a day here and there. The main thing is that you need to tend it weekly. Work out when to make the starter according to the rhythm of your daily life and when you’d be most likely to use it. Next week: Buckwheat Sourdough Muffins! I’m posting this a bit earlier than my usual schedule for weekly posts because no doubt by now you’re planning your holiday weekend. With the Memorial Day weekend just around the corner, and the beginning of summer cookout season, vegetarians, vegans and their omnivorous friends may all look at each other and say, “What do we do?” Casual outdoor parties which prominently feature hosts who play with fire need not be impossible to navigate for vegetarians, vegans, or the people who throw the party (who might not be vegetarian). There’s lots of options for everyone and this post will link to some of the yummy cookout posts here from previous years, as well as thoughts and tips for navigating cookouts that are less veg-friendly. If you’re a vegetarian or vegan, there’s no reason you can’t throw a helluva party with amazing food that omnivores will scarf up with pleasure. Likewise, if you’re an omnivore, you don’t have to exclude your vegetarian friends from cookouts. Throw a great party around the grill! There are only two requirements and they’re easy. Firstly, if you are hosting a cookout, always cook the vegetarian items on the grill before the meat items, if you’re planning on cooking any meat. (Vegetarian cookouts can be awesome! Check out the links at the end of this post.) The second requirement is that you and your guests love good food. 🙂 See? Easy. 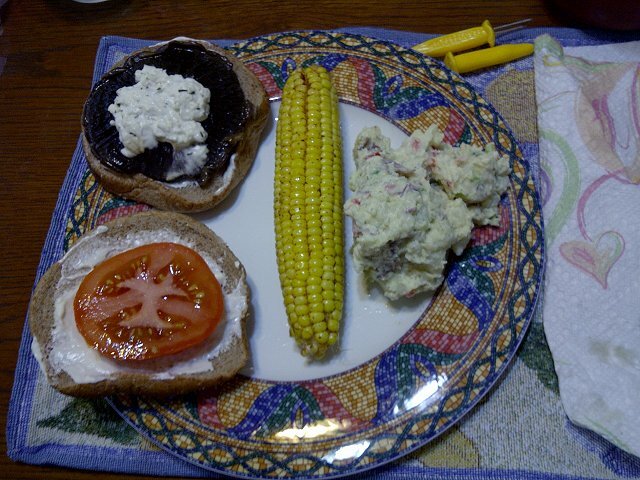 Portobello burgers, grilled corn and homemade potato salad. There are some vegetarians and vegans who just can’t stand to be around any meat at all. Please, if you’re an omnivore, find out if your veggie-loving friends are okay with a meat option if cooked after the veggie components of the meal go on the grill. If you’re a vegan or vegetarian and you’re invited to a cookout with friends who are omnivores, ask if you should bring your own burgers or soy dogs or if they will be provided. If you’re bringing your own, arrive early. At least early enough that the whole meal isn’t held up waiting for the veg items to be put on the grill. Try not make too big a deal about it all, or inconvenience your host. This really shouldn’t be a big deal. If they invited you to a cookout, it’s probably because they like you, enjoy your company, and want you to have a good time. You should honor their effort to accommodate your dietary choices and be happy to be included. On the off chance they invited you as some sort of passive aggressive way of disapproving of you and making you feel uncomfortable and unwanted, then they are very clearly and sadly in the wrong by any standard of civility and hospitality. How you respond to this is a personal decision and depends on the sort of person you are, whether you’re a “turn the other cheek” sort of person or a “my way or the highway” sort of person. Please don’t start a fight: people won’t remember that the host treated you poorly, only that you were screaming at them. Remember: the whole idea is to socialize, have fun, and eats tons of good food! BBQ Baked Beans, hot and spicy! If no accommodation is made for your food choices, there are still some workarounds you can do as a vegetarian or vegan. One thing I did at a cookout was to make a sloppy joe style burger for myself out of the baked beans — which I had brought. If you didn’t make the beans you can’t know for sure if it’s vegetarian or vegan, but it’s a small compromise, as such things go. 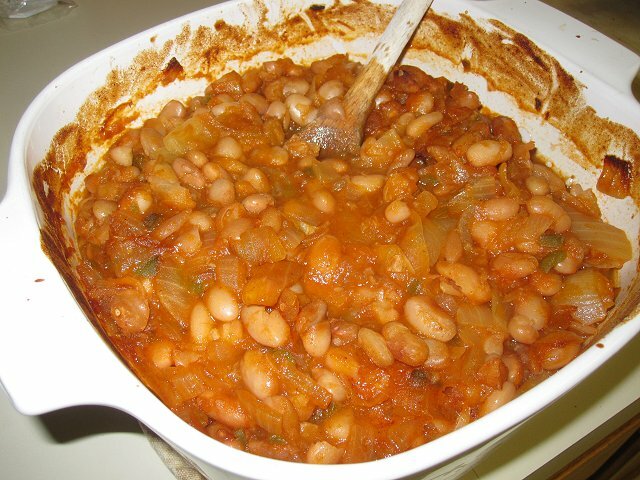 If you want to be sure such a work-around option is vegetarian, then offer to bring the BBQ Baked Beans. 🙂 They’re spicy and tasty and will win friends. I have people ask for this recipe every time I take it to a cookout where there’s people who haven’t had it before.